According to an article in the MetroWest Daily News, a Framingham man was recently arraigned on a charge of homicide by negligent operation of a boat. The charges stem from an incident last summer when the defendant and his friends, including the alleged victim, were boating on Lake Cochituate. According to the article, the defendant initially told the police that the alleged victim was wakeboarding, that he slipped while attempting to get back into the boat, and that the defendant heard the engine hit something and saw the alleged victim floating face down. The defendant also made a written statement, however. The written statement differed from his initial account, stating that the alleged victim had grabbed the rope to continue wake boarding when he somehow went under and then came back up, hurt and unconscious. Another witness that was also on the boat gave a third version of events. He told police that the alleged victim was on the wake board when the boat suddenly accelerated and went too close to the alleged victim. The boat hit the alleged victim and he went under. After two to three seconds, the alleged victim floated to the surface. The witness told the defendant that the alleged victim had been hit and asked if he was going to help him. The witness stated that the defendant then jumped into the water and attempted to drag the alleged victim into the boat. Again, however, the boat accelerated quickly and both the defendant and the alleged victim fell back into the water. The defendant succeeded in getting the alleged victim back into the boat after a second attempt and the three men returned to the landing dock. The alleged victim was taken to Beth Israel Deaconess Medical Center where he ultimately died. The state medical examiner ruled that he suffered a fractured skull with brain damage, as well as lacerations on his face, arms and hands from the propeller. For the Commonwealth to prove that the defendant is guilty of homicide by negligent operation of a boat under G. L. c. 265, § 13, it would have to establish the following beyond a reasonable doubt: (1) that the defendant caused the alleged victim’s death; (2) that the defendant intended the conduct that caused the alleged victim’s death; and (3) that the defendant’s conduct was negligent. Negligent conduct is conduct that a reasonable person knows, or should know, endangers human life. Regardless of whether the defendant has a strong defense, he is facing an extremely difficult situation – not only is he facing serious criminal charges, but his friend is dead. 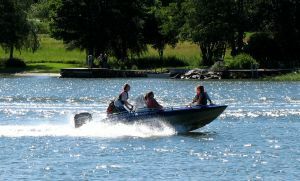 The defendant needs a skilled and dedicated attorney who will stand by him and thoroughly investigate the case, including hiring an expert to fully examine the boat for any potential mechanical issues that could have caused the boat to suddenly accelerate on its own. If you or a loved one is in an equally difficult situation where you have been charged in a tragic accident, you will need an attorney who can do the same for you. Attorney Daniel Cappetta is an experienced attorney who is well aware that serious criminal charges may issue against a person even where there has not been any true criminal activity. He will make sure that no stone is left unturned in defending your case. Call him for a free consultation.